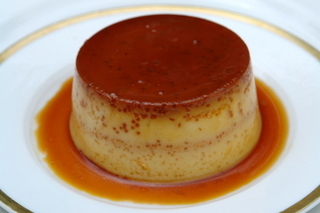 I enjoy a good flan every now and then, but if it were up to Nicolas we would eat flan every day. 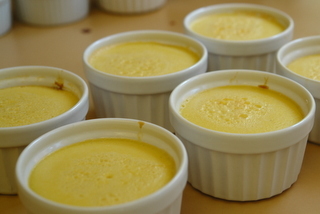 I also like to have a change from the classic vanilla flan and add different flavors to the flans. 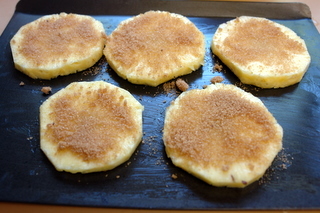 In Ecuador, especially on the coast, it is very common to find flans made with pineapple, coconut, mango, or other fruit. I’ve mentioned before that when I’m cooking for friends I like to make desserts that are relatively low maintenance and that can be made ahead so that I can focus on the appetizers and main meal; flan definitely falls into this category. 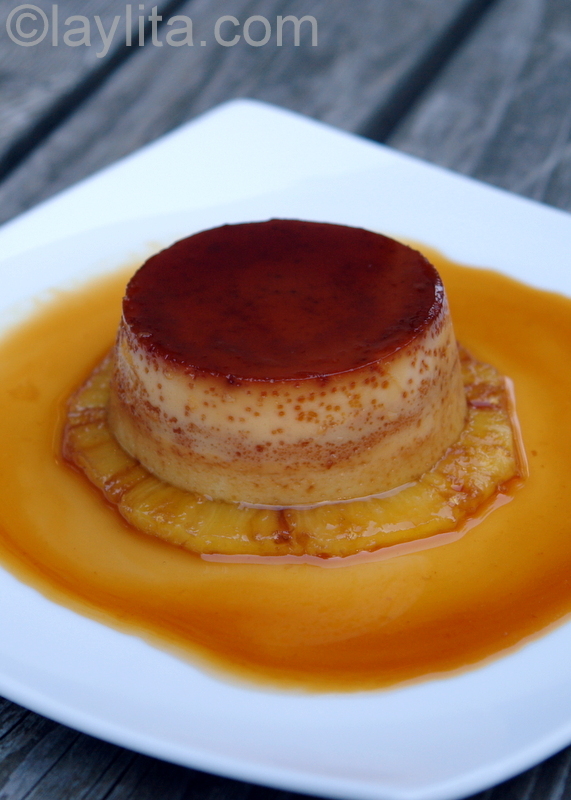 Pineapple flan, also known as flan de piña or queso de piña, is a custard like dessert made with fresh pineapple juice, sugar, milk, eggs, vanilla and rum. 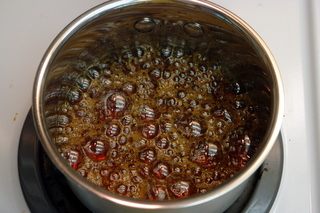 To make the caramel, bring 1 cup of sugar and ½ cup of water to a boil over medium heat and boil until it gets a deep amber color, about 8-10 minutes. Pour the hot caramel into the previously buttered flan molds or ramekins and try to distribute it evenly on the bottom of the molds. 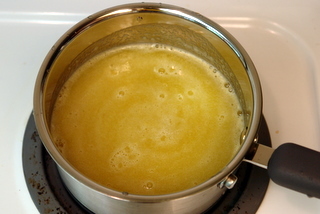 Combine the pineapple juice with the sugar and tapioca starch in a small saucepan over low heat and bring to a boil, keep an eye on it as it is prone to boil over, let simmer until it begins to thicken, about 5-8 minutes, remove and cool completely. Strain the flan mixture and pour into the caramel coated molds. 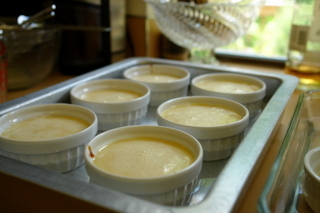 Place the flan molds in the oven dish with water – the water should cover at least ½ of the height of the ramekins - and bake until the flans solidify, about 45-50 minutes. Let the flans cool completely, then refrigerate for a couple of hour. 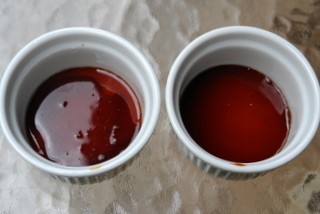 To help release the flans place the ramekins in a bowl with warm water before serving to melt the caramel and loosen the flan. 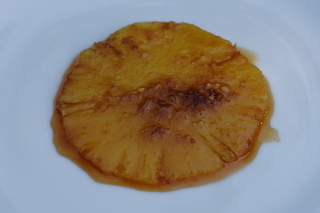 Pour a spoonful of brown sugar over a pineapple slice and place under the broiler until the sugar begins to bubble and caramelize. I used freshly made pure pineapple juice for this flan, you have to strain it and then let the foam rise to the top and remove the foam, but if you are in a hurry you can substitute with a good quality store bought pineapple juice, though you might want to reduce the amount of sugar for the flan if the store bought juice already has sugar. I used whole milk for this pineapple flan because I was out of evaporated milk and it worked just fine. 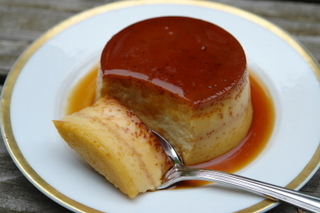 Whenever we made any type of flan with my high school friends we always used evaporated milk or condensed milk or a mix of both, I’m not sure why but a lot of Latin American desserts use them. We were talking about this with some friends from Mexico the other day and our guess was that it has something to do with marketing by a certain large Swiss food product company combined with the fact that not even a decade ago refrigerators were luxury items in many places so many dairy products are sold in cans and sealed bags. This recipe makes about 10 small individual flans, you can also use a large flan mold as well, just adjust the cooking time. Can i make this recipe in a large pan? It’s for a school project and I don’t have flan molds. Hi Sara – Yes, of course you can make it in large pan. It will probably take a little bit longer to set (bake) based on the size of the pan. Is it necessary to use whole milk, or can I use skim milk? Definitely whole milk or evaporated milk. This is a really awesome recipe!!! I had to make flan for spanish class and four kids ended up making flan, too! But mine definitely won for best taste, I went home with an empty dish! The pictures made it really easy to follow and delicious despite not including the rum and pineapple slices. Thanks so much for the great recipe! Keep up the great work, much blessing! Loved the pictures! Really stood out from all the recipes I was looking at and made me trust this one amongst the rest. My father’s birthday is tomorrow and he’s a huge fan of flan, so this really helped me out! I only found your website a few days ago, and already I am a huge fan. Your writing and photography are exceptionally talented. You mention in your personal info section that you may have some grammar mistakes since English is your second language, but I have found that your grammar and spelling is much better than many of us who are native speakers. Bravo, and I really appreciate you sharing your talents, knowledge and skill with us! I made your Empanadas Mendocinas for dinner tonight, and they were outstanding. I have two more meals in the freezer for my husband and myself, and I’m hoping the convenience of that and their deliciousness will help me get over the time investment in your glorious recipe, and put me in the mood to make them again soon. They are truly a labor of love, at least for a first-timer like me. Would it be sacrilege to top the meat mixture with a slice of Colby-Jack instead of the eggs and olive? My husband is a huge cheese fanatic. Next up is probably your irresistible sounding pineapple flan. Great presentation! I do a lot of entertaining and will definitely impress my guests with this recipe. Thank you for posting it! I just licked my screen!!! I was trying to remember this recipe that has been always “the hit” of my grandmother (she is 94!!!). 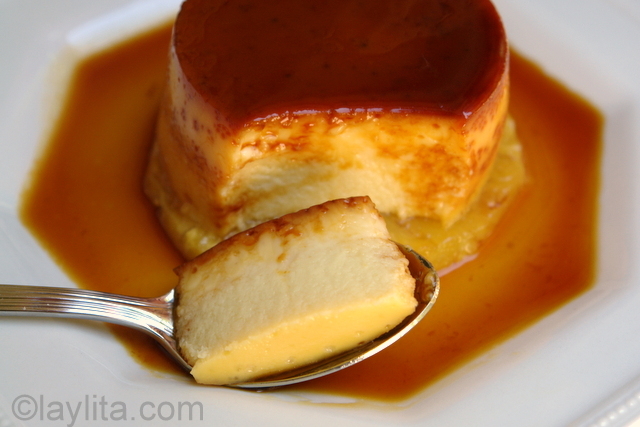 Now that I am living out of Equador, I miss so much the “flan de piña” that I need to make it at home. Its taste reminds me of my big family, my childhood, everything that I love. Thank you Laylita!!! p.d. there are more desserts made with condensed milk in Brazil than anywhere else in the world!!! AMAZING !!!!!!!!!!!!!!!!!!!! that is all i have to !!!!!!!!!!!!say!!!!!!!!!!!!!!!!!!!!!!!!!!!!!!!!!!!!!!!!!!!!!!!!!!!!!!!!!!!!!!!!! 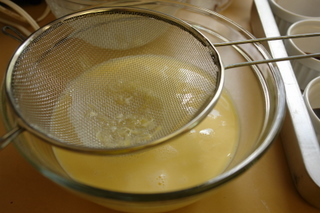 2) Tried straining the egg mixture but again was too thick to strain, so just poured it in the ramekins directly. 3) Even though a whole pineapple went in it, it didn’t taste much of pineapple at all…I was kind of disappointed about that. BUT, apart from all the issues I faced, this was an excellent recipe…so thanks! this recipe sounds delicious.. but how do i remove juice from a fresh pinapple? 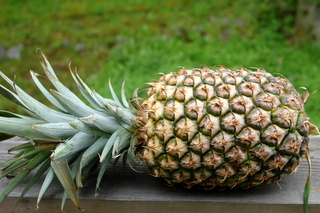 Can i substitue canned pineapple juice from concentrate, instead of fresh? Hi Mari – Cut a peeled pineapple in small chunks and blend them up until you get a thick puree, then strain and there you have the juice, and yes you can just use canned juice also (just reduce the sugar since it usually has additional sugar). 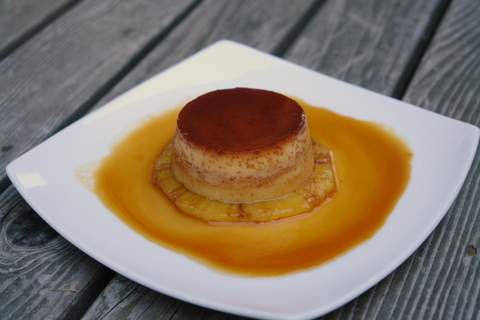 The pineapple flan sounds delicious! I don’t have flan molds so I’m going to try making mini-flans in a silicone muffin tin. I hope it isn’t a total disaster. 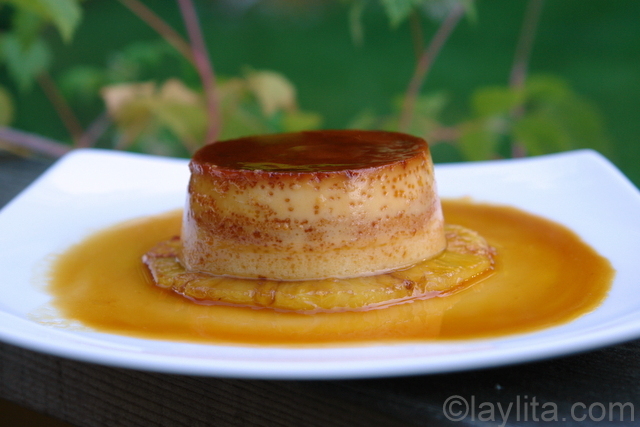 Laylita, i have started to make the flan and realized that you don’t mention what to do with the milk. Please let me know. thanks so much! Hi Maria – Oops, add the milk in step #5, I just updated the recipe. Thanks for catching that! 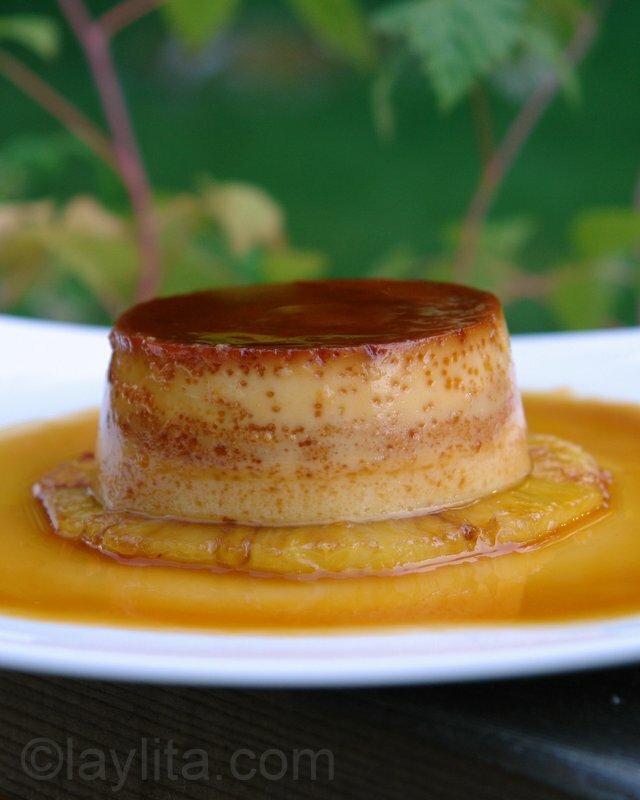 That flan looks amazing! I have tried many different flans in my life (vanilla, chocolate, coconut, dulce de leche, caramel, orange) but not pineapple yet, now I’m very curious about it! Layla, what a beautiful and yummy looking flan! Everything on your blog looks fantastic. You are one talented young lady! I haven’t been to your blog for a while. Just subscribed to you to read more of your yummy recipes. Keep up the good work! ohhhhhh, your blog is SO be-aut-i-ful !!! I saw your entry on blogs’cool about the dum-dum who stole your material – I hope blogger will bring the full weight of punishment down upon their sorry heads. I am so in awe of your work – the recipes and the photographs – you have truly mastered this blogging caper. Do let me know when your cook-book comes out – I will be first in line!! Gorgeous texture, and a nice twist. Wow! That looks soooo delicious! Oh my! EVERYTHING on this blog looks delicious! Thanks for all the wonderful recipes. I am very impress with your web site especially the pictures, they are very clear and they help alot in the preparation of the recipes. Thank you. Great Job! That flan looks really good! jeez…i haven’t had flan in i-dont-know how long. this recipe and these photos made my day. thanks! De-li-cious! 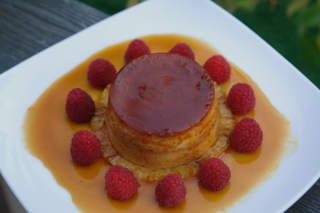 Your flan has me drooling! Really beautiful and mouthwatering!